Since 1985, non-Hazmat truckers have had the same mandatory minimum insurance limit of $750,000. This is despite raising inflation and claims costs. Think about how much insurance you have when taking into account both personal auto and umbrella coverage. Chances are you have more coverage than some truckers on the road. Separate efforts are underway to consider this issue. The Federal Motor Carrier Safety Administration (FMCSA) closed out the comment period on a rule change last February. Many independent truckers complained insurance premiums would be too costly for them and the agency’s next step is unclear. Meanwhile, some members of the U.S. House of Representatives have introduced measures to increase the limits. The current SAFE HAUL Act of 2015 proposes limits to increase to $4,532,550. The bill is an updated version of the 2013 act of the same name, which did not pass during the last Congress. The good news is that trucking accidents are declining. However, the cost per claim is on the rise. Insurance advocates and some trucking associations see good reason to raise rates (and many suppliers require a $1 million insurance limit due to third party liability). However, the American Trucking Association points out that the vast majority of accidents are still covered by the current $750,000 limit. than some truckers on the road. Regardless of whether FMCSA raises the limits or if Congress is successful in doing so, the fact is that trucking companies are better off having more than minimal coverage if they want to be socially responsible and stay in business. When trucking accidents have led to huge court settlements, trucking companies risk going out of business and accident victims can suffer lifelong physical and financial consequences. When and if trucking insurance limits will increase is anybody’s guess. Congress’s appetite to focus on the issue appears limited and the FMCSA rules process has different twists and turns. To learn more, check out my article, published by AmWins. Lipold Communications provides full-service strategic communications services. To learn more, click here. The cyber insurance market is booming! Customers want to either get a cyber policy for the first time or boost their coverage through higher limits and more endorsements. And insurance companies are very eager to sell various forms of it. But that does not mean buying and selling cyber coverage is easy. 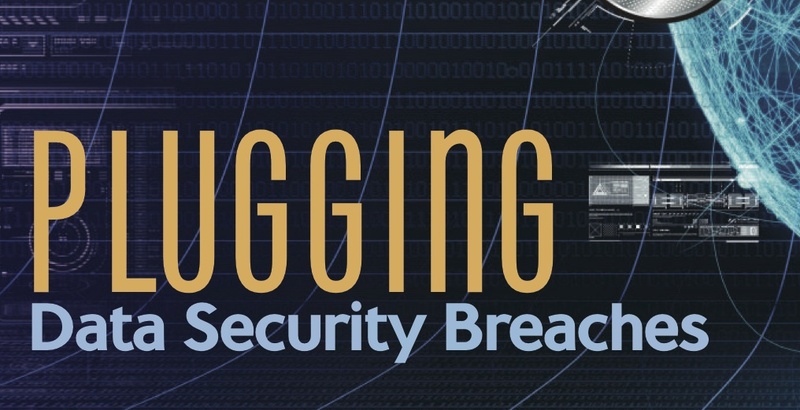 As I explain in my recent Leader’s Edge article, “Confusion Reigns,” cyber insurance is going through the growing pains of a burgeoning insurance line. Since the policies offered by 45-plus insurers are not standardized, the market offers a myriad of potential endorsements that range from data breach coverage to reputation damage to cyber extortion. the coverage matches the customer. And while there is growing demand for higher limits of insurance protection, agents and brokers sometimes have to layer coverage for their customers while keeping a close eye on various exclusions. It also means that agents and brokers have to carefully comb through each policy to ensure the coverage matches the customer. And while insurance buyers should always be well informed about the coverage they are buying, this is especially true for cyber coverage. on the bottom right hand side of this blog. Question: When there is so much Internet noise, how do you make sure your company stands out? Answer: Digital marketing. As I explain in my recently released Leader’s Edge article, “From Buzz to Bucks,” digital marketing encompasses everything from social media marketing to links, search engine optimization (SEO), video, advertising and other channels. In general, the insurance industry is behind other sectors when it comes to mastering digital marketing. Digital marketing is not a replacement for all traditional marketing techniques, but it a crucial part of a marketing plan. The article includes interviews with digital marketing experts and agents and brokers reaping positive results from digital marketing. Their advice can help nearly any company. 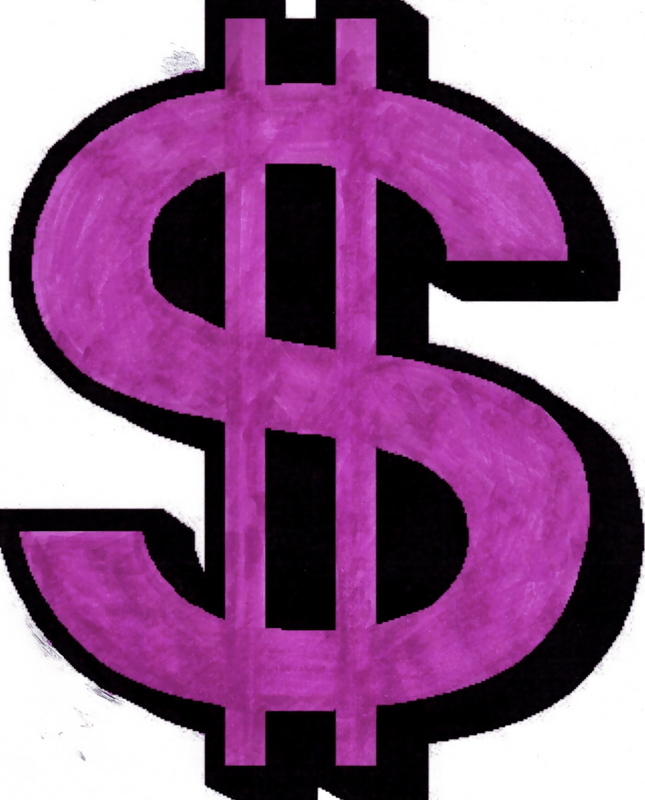 There is also a sidebar devoted to determining return on investment (ROI) and another covers social media. Some Digital Marketing Tips Getting started in digital marketing is just like any other form of marketing or public relations strategy. Define your customer, their interests and pain points to develop appropriate messaging. I don’t believe you can know enough about potential or current customers. Surveys, focus groups and asking readers for follow-up are important tools for better knowing customers. A lot of companies skip this step to their peril. Don’t make that mistake. Hiring an outside firm is a good idea to assure objectivity. At the very least, make sure sales staff keeps track of lead origination. They should be asking – and keeping records — about how customers heard of the company, what prompted them to contact the company and content of interest. Also, take a close look at your website. Since about half of viewers use their mobile devices to look up information, at the very least, the website needs to be responsive so it’s easy to read and navigate. Make sure call-to-action buttons are well placed to transform readers to leads. Re-evaluate your social media strategy. Are you on LinkedIn, Facebook, GooglePlus and Twitter? If so, post on a regular basis to keep your company top of mind. If not, get signed up! Make sure your material meets your customers’ needs. Re-evaluate your website and other content for SEO. Do not stuff content with searchable words. Search engines hate the practice and give sites that do it lower rankings. Blogging is another way to provide quality content. It requires a time commitment, but regularly introducing quality content – at least once per week — through blogging is very effective for boosting SEO and keeping your company top of mind. Post it on social media sites including LinkedIn. Take the best sentences and points and feed them into Twitter. To ensure originality and be rewarded by search engines, avoid companies that sell pre-packaged content. Yes, it’s cheaper, but it might not fare as well with search engines. Quality content can be developed by company subject matter experts, guest bloggers and freelance writers. Graphics play a critical role in presenting content. The right picture can be worth a 1,000 words. Since many people prefer to get information by watching rather than reading, video also plays a role in digital marketing as well.I believe that any new marketing strategy should be approached humbly because the arena continues to evolve. Each company should track every tactic they pursue to see what is most effective. For example, an agent or broker who sells both personal and commercial lines might find that Facebook postings are more effective for selling personal lines and LinkedIn works better for commercial lines. Which digital marketing tactics are working at your company? Should truckers be required to sleep two nights in a row — but end up driving during rush hour — or one night to avoid it? This question has become controversial enough for Congress, through passage of the Cromnibus bill in December, to require the Federal Motor Carrier Safety Administration (FMCSA) to take another look. My article, “Congress Mandates Suspension and Study of Hours of Service Rules for Truckers,” published yesterday in the AmWINS Groups’ Client Advisory, takes an objective look at an issue. The article also provides a detailed look at the study based on the legislative language in the bill. I hope you will take a look. While spending the past two decades as a business writer covering the insurance market, I finally got a chance to share what I have learned about auto insurance with a new audience — consumers. My article, How Insurers Determine Your Auto Insurance Premium, was written to explain the major factors that drive (no pun intended!) auto insurance premiums. The article’s main objective is to provide more comprehensive material than similar articles while being easy to understand. Thanks to http://www.cheapcarinsurance.net for the opportunity. I hope you’ll check it out! Who knows, you might save a few bucks! To attract and retain customers, insurance brokers need to take advantage of data already buried in their electronic and paper files. 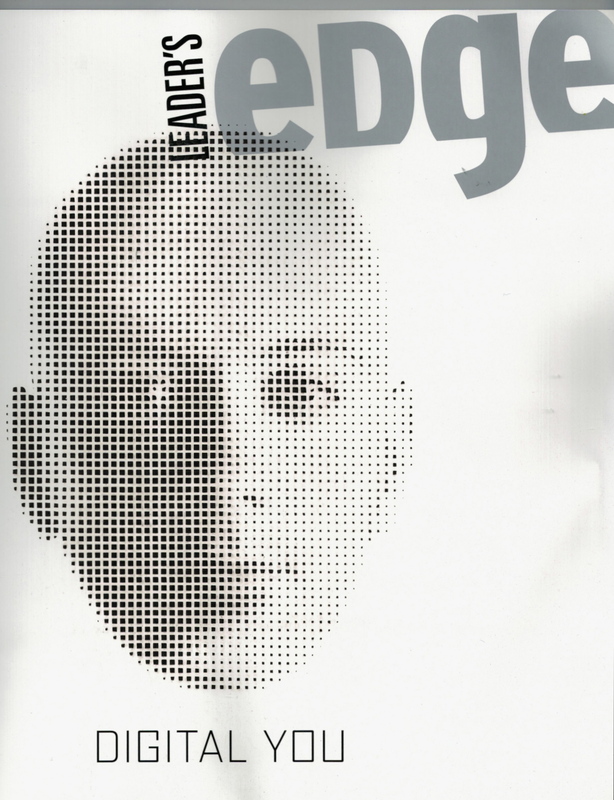 My Leader’s Edge article, In the Zone: Keep Your Head in the Game Retaining Clients By Using the Competitive Data Hurtling Right at You, explains why 20th century business practices and assumptions no longer work in a world of Internet purchasing and big data. Business insurance buyers are already shopping around online for coverage that once depended solely on business relationships. Insurance companies are already using their data to target and sell products to specific customer profiles. And since insurers also add to their data with outside data to develop models, brokers must follow suit to retain clients and expand on the insurance coverage they are already selling. I hope you enjoy the article. Feel free to comment below as you wish. P.S. If you want to learn more about data and analytics, you can see past blogs on the topic under the predictive modeling tag. Thank You Tech Cast Global!!! 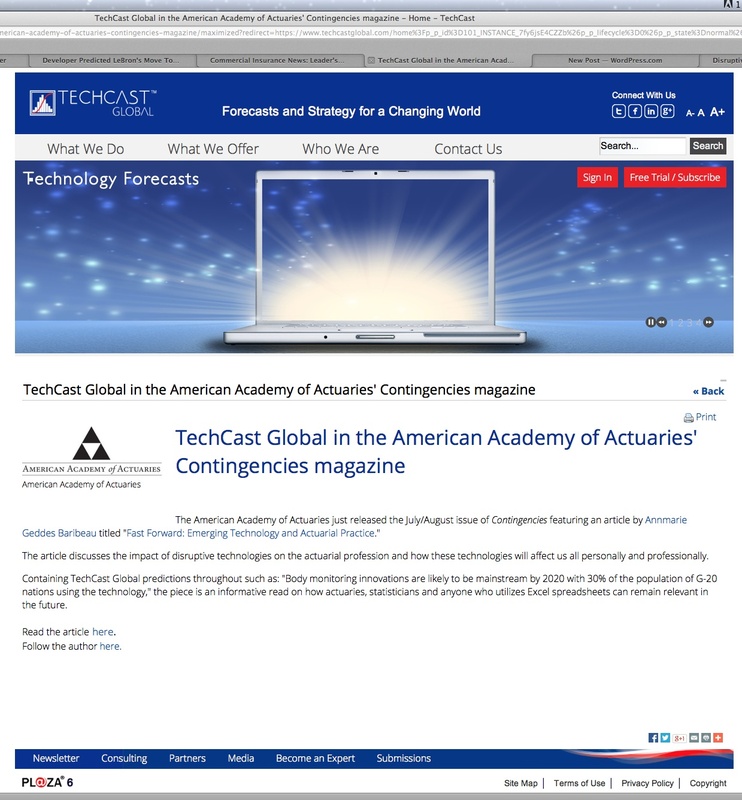 TechCast Global, which contributed significantly to my Contingencies article about disruptive technology and its effect on actuaries, the insurance industry and the rest of us, posted my blog and article about in the news section of their website. This is not the first time TechCast has been a good source for my forward-thinking work. Another article I wrote, Fully Exposed, for Leader’s Edge magazine, covers the future of health care and the financial, ethical and insurance implications. For the unfamiliar, TechCast produces reports on the future of everything from agriculture to economic development around the world. The organization predicts events by a degree of possibility. The website is www.techcastglobal.com. Meanwhile, my article continues to receive retweets from folks around the world. The article was challenging to research and write, so I am pleased by the response. More of my articles will be published soon. The topics are: cyber coverage, terrorism reinsurance and how insurance agents can harness new technology to inspire retention. Whether for publications or websites, my goal is to produce quality content for clients who share my philosophy of publishing factual and helpful information to attract and retain readership. 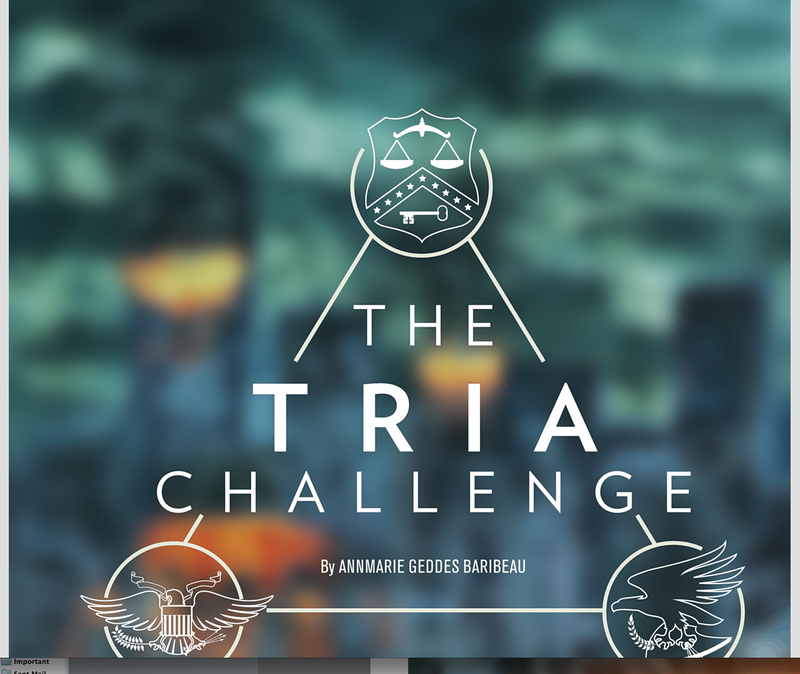 Just click the follow button at the bottom right corner of this blog! Disruptive technology — defined as a new technology that unexpectedly displaces the established one — will change most professions. In the future, we will collaborate in the Cloud through mobile technology and intelligent interfaces while monitors track our vitals and aerobic activity. Big data will be fed into mega computers that will automate calculations and analysis. Insurance will be based more on the individual situations of people and companies. Artificial intelligence is already disrupting the medical field when computers can more effectively diagnose than doctors. Lawyers’ efforts to find precedents are already becoming automated and (sigh) computers can produce basic news articles. 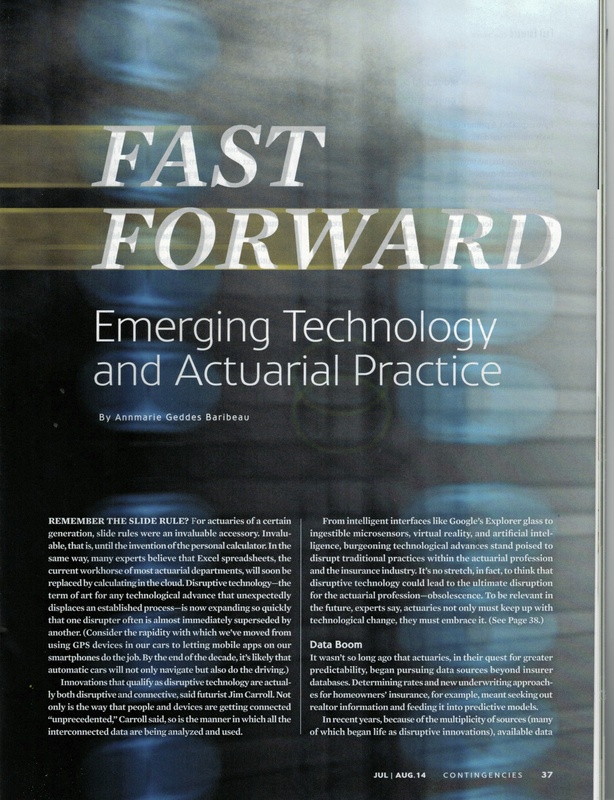 Actuaries are not immune, as I explain in my article, “Fast Forward: Emerging Technology and Actuarial Practice.”Published in the American Academy of Actuaries’ July/August issue of Contingencies, I believe it highlights disruptive technologies that will affect all of us both professionally and personally. I hope you will check out the article and enjoy seeing a glimpse into the future of the actuarial profession and the insurance industry. In many ways, the article is a call to action for the actuarial profession, but it should also be a wake up call for the rest of us who also grow tired of the constant learning and adapting to technology that is necessary to maintain professional relevance. In summary, for actuaries to excel in the future, they will, both literally and symbolically, have to let go of their beloved Excel spreadsheets and other tools. The fact is Excel is quite limited compared to what is becoming possible through technology and will likely go the way of the slide rule and calculator. Personal computers and laptops simply cannot hold the data or offer the processing power of GPGPU chips that come from the gaming graphics world, the article explains. What do you think? Let the world know by commenting below. Be the first to know. Follow my blog by clicking the “follow” button on the bottom right hand corner below.